At GreenThumb Manchester South we treat over 2,500 lawns each year, with each customer generally receiving at least four seasonal lawn treatments annually. Wonderful, efficient, conscientious company. Never let me down and carry out work to top class finish. Have used them for 20 years and they never fail to offer first class service. Very impressed always use them. They are very efficient. Never any problems, they turn up on the day that they say they will, and do the service that they promised. I am very satisfied with the work provided by Ben Luckett - he knows what he's doing. We have used GreenThumb for a number of years and always found them to be very professional. Great product. Grass is green all year round. Affordable and great service, recommended to neighbours. Green Thumb have cared for my lawn for many years and I have enjoyed the results. 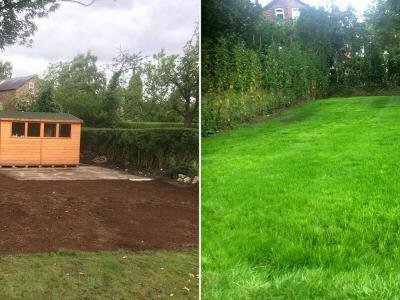 The improvement in the appearance of the grass was noticeable soon after they started treating it and the staff are very helpful and friendly. No weeds, lush green grass and no burnt patches where I have accidentally spilled too much weed killer. Special thanks to Ian for the miles he has trodden up and down my garden.